At this point in January, it really should be winter. But the balmy weather has fooled plants and animals into thinking that we’ve moved into spring. So, I’m re-naming this month Springuary, the first month of Sprinter. The blackbirds and the greenfinches have been dawn-chorussing for days now. They crank up at around 7am, which is a much more civilised hour than the rowdy 4.45am reveille in May. And occasionally, I hear a lone blackbird practicing its wobbly notes in the dead of night. Apparently the young males take advantage of these quiet hours when there is no other competition: they can perfect their warbles and riffs without it turning into territorial oneupmanship (or oneupbirdship). A pair of collared doves — a species that can mate for life, and mate all year round — are looking decidedly frisky, in a beige and puritanical sort of way. 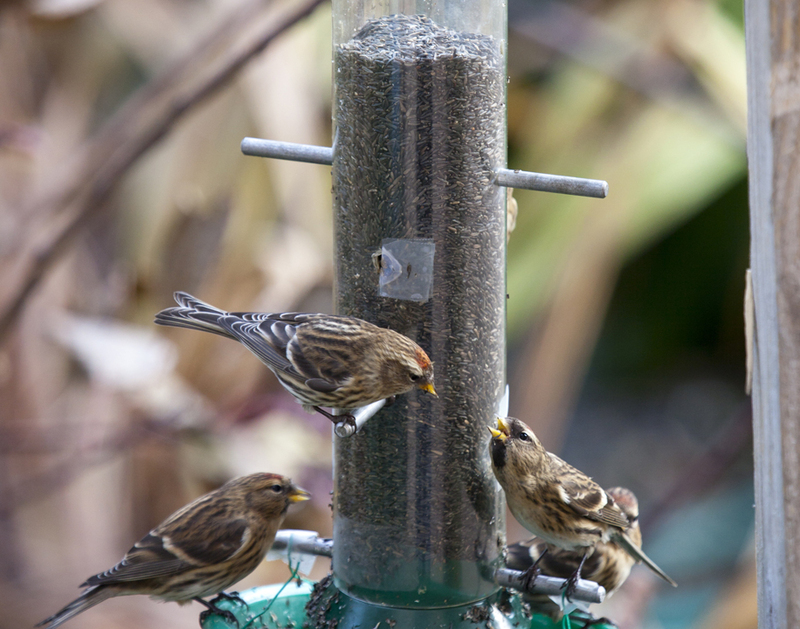 The little redpolls, who arrive in winter and depart in spring, are still visiting. So there is a jumble of birdlife at the feeders. On the floral front, there is a crazy collision of seasons. The snowdrop, Wordsworth’s “venturous harbinger of Spring, and pensive monitor of fleeting years”, is flowering weeks early, while the last rose of last summer, a long-blooming Rosa x odorata ‘Mutabilis’ is still hanging on palely. Shasta daisies and hardy geraniums are also popping out the occasional, surprise flower. Many plants that normally bloom in mid or late spring are already flowering. Among them is the little bronze-leaved celandine, Ranunculus ficaria ‘Brazen Hussy’, discovered in an English wood by the late Christoper Lloyd. 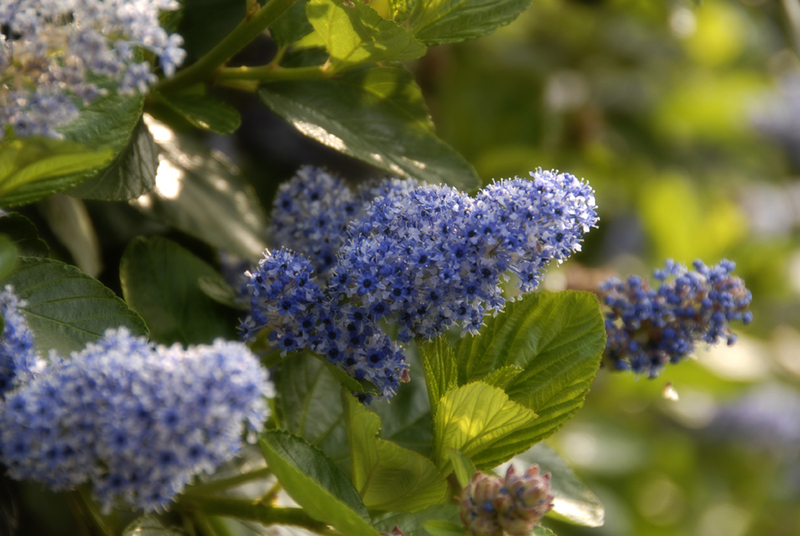 And, on our boundary, the evergreen Ceanothus ‘Trewithen Blue’ has been blooming for months. Usually it takes a break in winter before throwing its energy into a proper late-spring display. I have to admit that although it is fascinating, I find this hodge-podge of a season disturbing. I wonder am I alone? What’s flowering in your garden that shouldn’t be? 1. My book, The Living Garden: a place that works with nature, is to be published in Germany by Verlag Freies Geistesleben in 2013. I’m very happy about this, especially since it is a nod to my many German ancestors, who account for at least three-quarters of my blood, and who enjoy euphonious names such as Seberger, Muller, Strobel, Zilberstorff, Routzong and Wahl. The Sunday section is available exclusively in Ireland (not in the UK, alas). Why not stroll into your local newsagent next Sunday, January 22nd, and give it a go? **UPDATE** I’ve just heard that the Sunday section will be online on the Times website. Hurrah! I often wondered why blackbirds were noisy at night – often hear one in evenings. I find the clashing of seasons disturbing and more so that people aren’t cutting back perennials as they are still flowering. Surely the plants need a rest. Congratulations on the German edition of your book; great news. Also, delighted you will be back in print at the weekends; looking forward to reading your columns again. Can’t get used to your replacement on the I.T. Old age – find it hard to deal with change! The unseasonal warm weather has more snowdrops open at this time of year than ever noticed before with the season about two weeks ahead of normal. Primulas are also in flower; crocus and leucojum also. 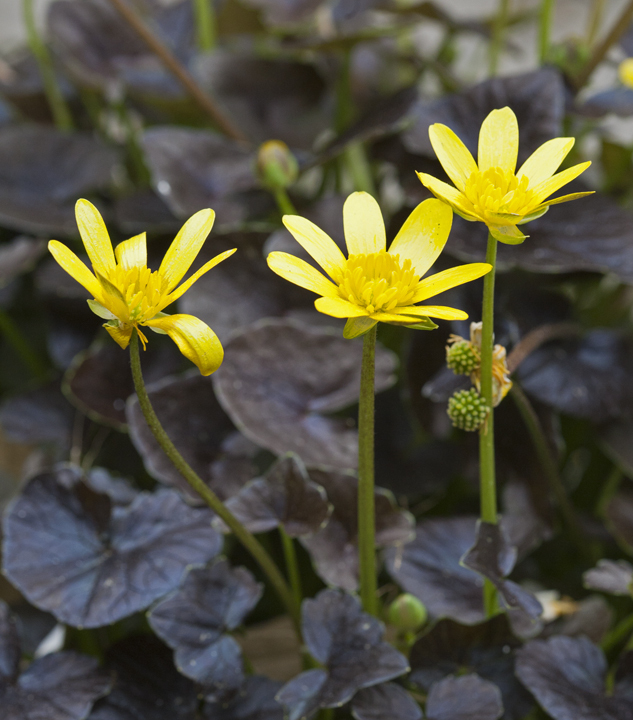 I adore ‘Brazen Hussy’ – hard to believe it’s a chance seedling and not bred on purpose. Gorgeous little thing. I saved a large quantity of apples especially to put out for the blackbirds, and they never arrived – then suddenly they are back squabbling on the lawn, and the pile of apples is going down rapidly. I love to hear their song, and the robins have also joined the choir – as for out of season flowers, well, the recent frosts we have had seem to have knocked them on the head. No you’e not alone in finding this weather disturbing. The weeds are having a field day in my own garden. I was weeding this week and think it’s the first time I’ve ever managed that in January – the ground is usually much too wet or frozen. I hope we don’t all get caught out (am including nature as a whole not just the human variety). I was going to say congratulations in German, but I realise I can now only say “my car is broken” in that language as well as something else which is unspeakablly rude. At least there are no language barriers for the new column – so congrats for that too. When will you have a French version? Congratulations for your new job, it seems very exciting. This year is very strange indeed. I had rosa centifolia in full bloom in June and then they bloomed again in August. I think a lot of plants were fooled by the dry warm spell in April. My bees were out just after Christmas on St Stephen day. That’s certainly very bad for them. Brava Jane! Well done and congrats on the new gig. Hopefully the column with be digital soon so those of us in the US can read along. I think you need to get suggestions for a collection of journalists though – a ‘draft’ or a ‘copy’ of journalists, or a ‘front page’, not maybe a ‘hold the press’? Had a blackbird warbling too the same way, he was a mere metre away, took me ages to see him as I thought he was distant as it was so quiet! Keep seeing good reviews of your book too – well done again! I will be buy The Sunday Times from now on. I’m delighted to hear that you are “back”. My garden is full of flowers at the moment – Vinca, Kerria, daffodils, snowdrops, Centaurea, scabious, roses, yellow crocuses, muscari and hellebores. An early flowering species of daffodil has been on the go since the middle of November – it should flower from late January. A hellebore has been flowering since November too. I wonder if we will have a rather insipid flowering of these plants later in the season? The dawn chorus is in full throat here in Terenure when I hit the road for work at 7.15 a.m. I find this juxtaposition of seasons rather alarming and hope it’s a once off. It’s all topsy turvy here too and I’m not that keen. I AM enjoying the tawny owl hooting outside the bedroom window though. The robins are singing through the night too. There’s a lot of bustling going on in the trees at the the moment as small birds vie for the best nesting spots. Have loved your columns Jane! Here in the Northeast U.S. we are also having an unseasonable January. I’ve spent most of this weekend taking care of pruning that usually gets done at the end of Feb. While it’s disturbing, I wouldn’t mind an early, and long spring! Great pictures and wonderful blog! Will be back often! You are currently reading Springuary Days at One Bean Row.